And you’re a Grade 3 and you’re a Grade 3, EVERYONE’S A GRADE 3. Bermuda Triangle’s cute mermaids let it all out for everyone to see!! Chapters of the usual three are in the new issue. 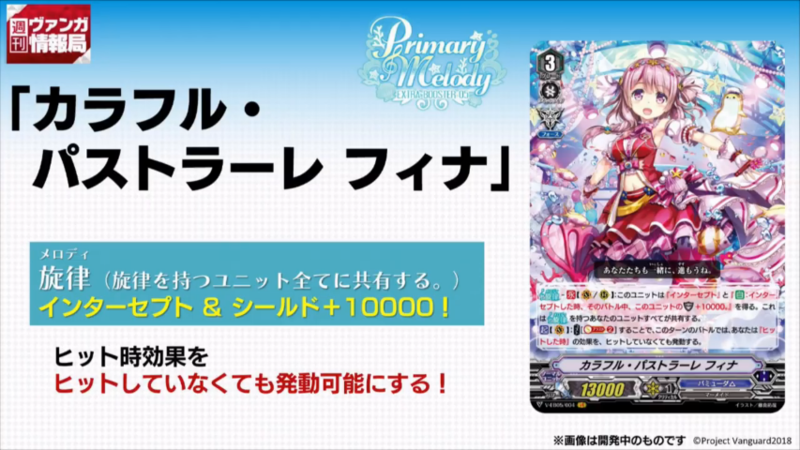 Melody – AUTO (VC/RC): When attack hit a Vanguard, if there are 4 or less cards in your hand, draw 1 card. All of your Units with Melody share this. ACT (VC): COST [Counter Blast 3] Return 3 cards with Melody from your Drop Zone to the hand. Melody – CONT (VC/RC): This Unit gains “Intercept” and “AUTO: When this card Intercepts, during that battle, this Unit gains Shield+10000.” This is shared with all of your Units with Melody. ACT (VC): [Soul Blast 2], during battles this turn, your “When this hits” effects also activate when you don’t hit. The Schokolade Melody Trial Deck comes with 1 of 5 different promos that are the Pastrale Girls back in their home town. Its full contents are worthless to name at the moment due to Bermuda Triangle’s constant habit of Katakana Furigana over Kanji.